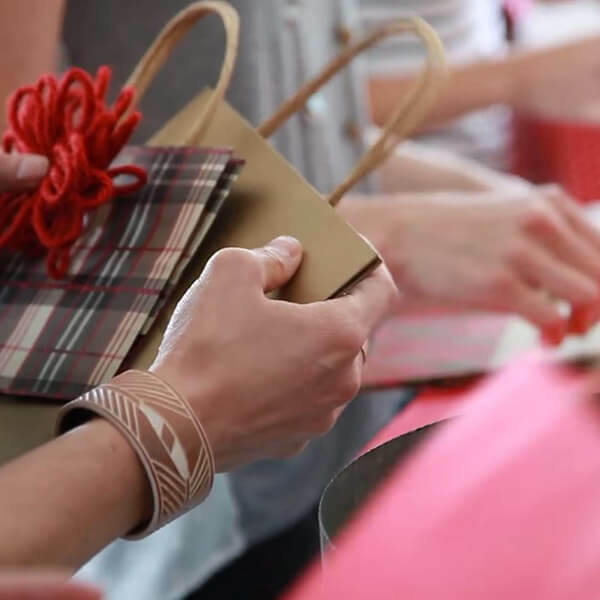 Here’s an easy Christmas party idea that actually takes some stress out of the holiday season: turn wrapping gifts into a social event. Just pick a date, gather a few gift-wrapping supplies and invite the girls to bring over the holiday gifts they need to wrap. Time will fly. Stacks of beautifully wrapped packages will pile up. And by party’s end, the happy girlfriend gaggle will leave with a holiday to-do checked off their lists—and feeling great about the whole shebang. Fun, inexpensive gift trims: ornaments, snowflakes, bells, silk flowers, etc. Don’t clean house beforehand. A workshop is a casual environment! Set out a few simple snacks (a hunk of cheese on the cutting board, a basket of crackers, a bowl of grapes and bottles of water are good). Play our Giftology videos to inspire your guests. Crank up some Christmas tunes. Welcome your guests and get them started. Guests can wrap their own gifts or somebody else’s. Those who aren’t feeling industrious can snack and coach from the sidelines, so there’s no pressure. Hostess tip: Always, always, always have gift tags handy. And make sure guests put them on right away! You will be sorry if you break this rule.